Seedlings were transplanted in a sandy loam type soil on 3–4 Jun at the University of California's South Coast Research and Extension Center. Experimental plots were 3 rows wide (5–ft centers) by 40 ft long and separated by a 5–ft buffer. 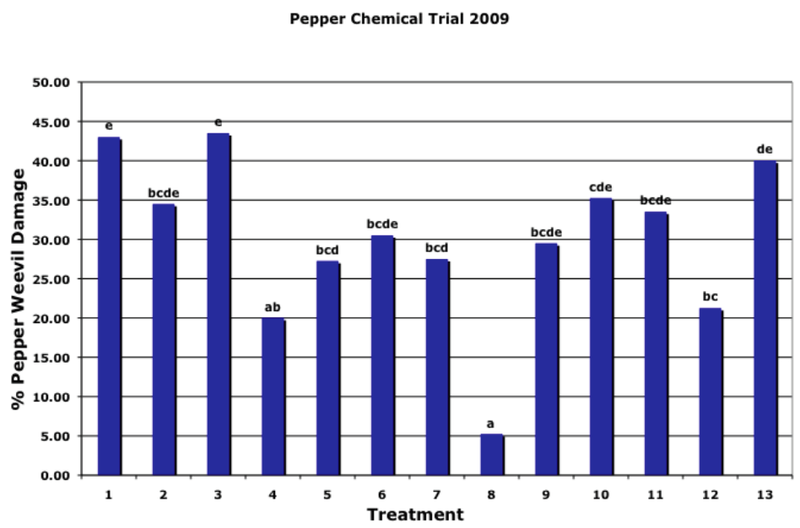 The pepper transplants were drip irrigated (water pH 7.2 – 7.5). Treatments were replicated 4 times in a RCB block design. Application dates and a treatment list are shown in Table 1. All applications were made at twilight. A tractormounted boom sprayer with 6 nozzles per row incorporated D–3 orifice disks, #25 cores, and 50 mesh screens. Operating pressure was 125 psi delivering 100 gpa. All treatments received an adjuvant as specified in Table 1.
a Treatments 5–7 were sprayed one time at flowering on 22 July. b Treatments 4, 8 and 9 were sprayed three times on 22 July, and 5, 19 August. c Treatments 10 &11 were soil drenched one time at transplant on 4 June. d Treatments 2 & 3 were soil drenched two times on 4 June and 12 August. f Treatment 13 was sprayed three times on 5, 12, 26 August. Leafminer populations and effects on leafminer parasites were evaluated by weekly counts of leafminer pre–pupae and pupae and dead adult parasites in four 9x11 inch trays/replicate from 1 Aug through 9 Sep, inclusive. On (14–15 Sep), 200 mature–green to ripe fruit were harvested from the center row of each replicate (800 per treatment) and examined for Lepidopterous internal damage (TFW), external damage (BAW), and hemipterous pests (SB). One Hundred fruit were also inspected for damage from pepper weevils (PW). Lepidopteran pressure was moderate in the categories of External damage by (BAW) (Table 2). The Voliam Flexi and the HGW 86 treatments provided the best control of the Lepidopterous insects. Internal damage by (PW) was significant this year, and the Voliam-Flexi and HGW 86 treatments provided the best control. Leafminer populations were low, and no statistical separation was possible on any sample dates. The results of dead adult parasites were not included this year due to low numbers recorded from the tray counts. No phytotoxicity was observed in any of the treatments. All data were analyzed with ANOVA and a Fisher's Protected LSD test (P<0.05). Psyllid populations were low this year. Figure 3. Damage by beet armyworm, tomato fruitworm, and cutworms. e Treatment 12 had Actara applied on 22 July, and 5, 22 August; Xentari on 5 August, and Coragen on 26 August. g Means in columns followed by the same letter are not significantly different (P<0.05 level, Fisher's Protected LSD Test). Internal damage due primarily to (TFW); external damage due primarily to (BAW). Bugs include Lygus and (SB). Calyx damage can attributed to (TFW), (BAW), and (PW) feeding. Seedlings were transplanted in a sandy loam type soil on 3-4 June at the University of California's South Coast Research and Extension Center. Experimental plots were 3 rows wide (5–ft centers) by 40 ft long and separated by a 5–ft buffer. 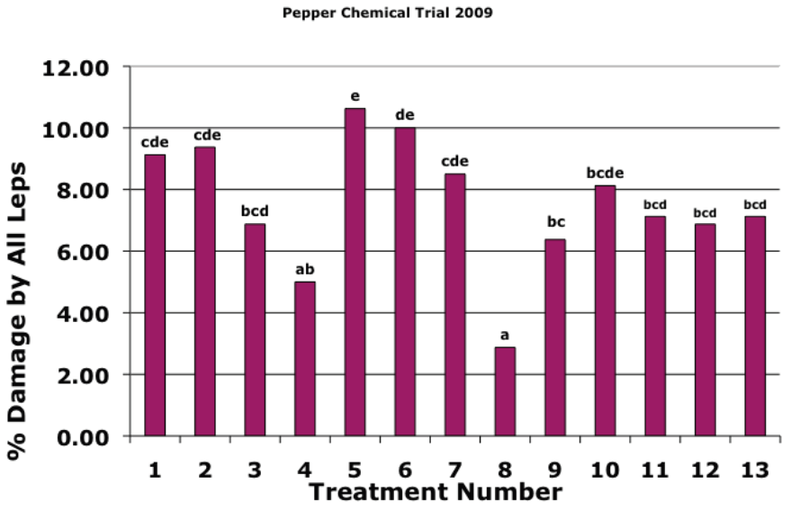 The pepper transplants were drip irrigated (water pH 7.2 – 7.5). Treatments were replicated 4 times in a RCB block design. Applications were made using a rotation of materials specified in (Table 3). All applications were made at twilight. A tractor–mounted boom sprayer with 6 nozzles per row incorporated D-3 orifice disks, #25 cores, and 50 mesh screens. Operating pressure was 125 psi delivering 100 gpa. All treatments unless specified in table 3 received a non-ionic surfactant X–77 at 0.125% v/v. Leafminer populations and effects on leafminer parasites were evaluated by weekly counts of leafminer pre-pupae and pupae and dead adult parasites in four 9x11 inch trays/replicate from 1 August through 9 September, inclusive. Psyllid populations were monitored by counting the total number of eggs, nymphs, and adults from five plants per replicate (20 plants per treatment). On (14–15 September), all of the mature–green to ripe fruit were harvested from the center row of each replicate. The number and weight of the fruit were recorded for harvest yield data. From each replicate 100 fruit were sub–sampled (400 per treatment) and examined for Lepidopterous internal damage (tomato fruitworm) and external damage (beet armyworm)(Figure 5). 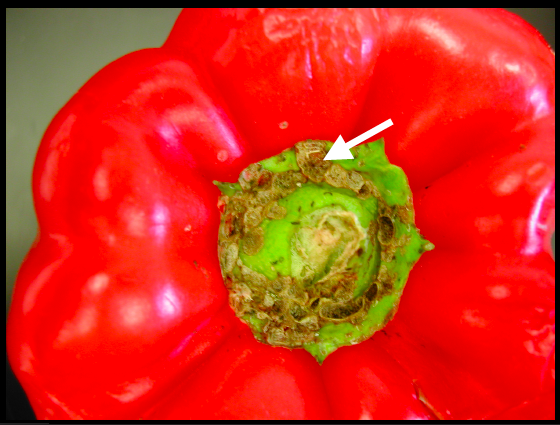 Fruit were also inspected for damage to the Calyx, and from pepper weevils (Figure 6) and hemipterous pests. 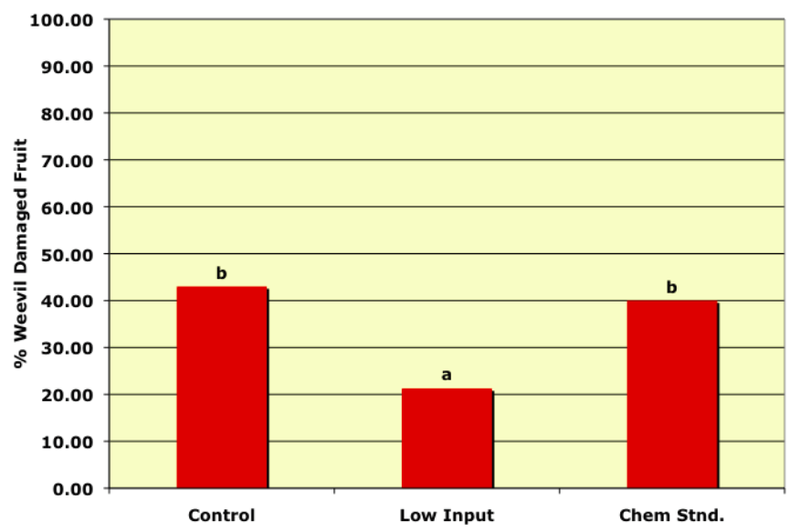 The results for insect damage are summarized in (Table 4). Lepidopteran pressure was moderate in the categories of External damage by beet armyworm and no differences were seen. Internal damage from tomato fruitworm was not significant this year. 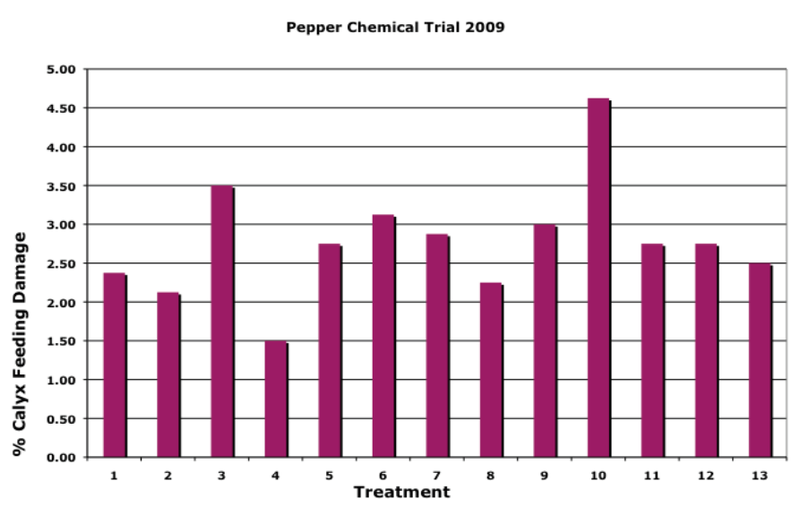 Internal damage by pepper weevil was significant this year and the low input performed the best. There were low levels of damage to the calyx and no differences were found between any of the treatments. Leafminer populations were low, and no statistical separation was possible on any sample dates. The results of dead adult parasites were not included this year due to low numbers recorded from the tray counts. No phytotoxicity was observed in any of the treatments. All data was analyzed with ANOVA and a Fisher's Protected LSD test with (P<0.05). a Means in columns followed by the same letter are not significantly different (P<0.05 level, Fisher's Protected LSD Test). Internal damage due primarily to tomato fruitworm; external damage due primarily to beet armyworm. Bugs include Lygus and stink but. Calyx damage can be attributed to tomato fruitworm, beet armyworm, and pepper weevil feeding. Larvae One day old newly emerged adult L. trifolii were allowed to oviposit on lima bean plants. Ten first instar larvae were identified on each plant and any remaining larvae were killed to simplify tracking and recording of survivorship. The leaves of each plant were sprayed until runoff to achieve maximum coverage of the leaves. Larval mortality was recorded daily until 100% kill or pupation was achieved. Lyriomyza huidobrensis were tested in the same manner using peas as the host plant. 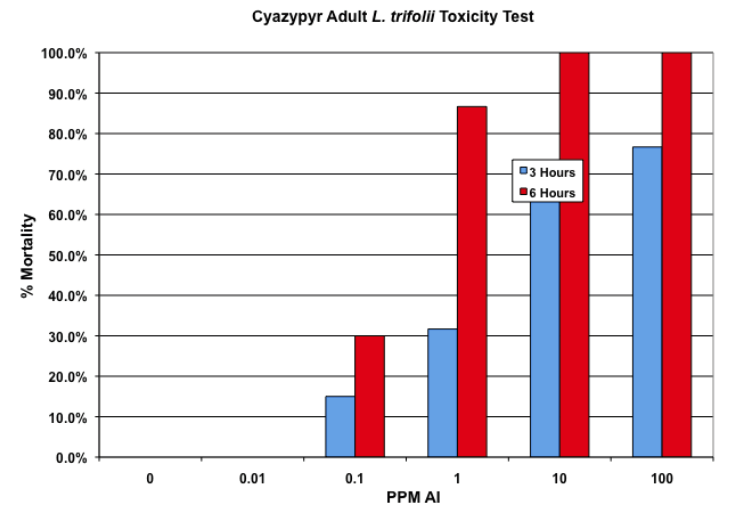 Results: Rynaxypyr and cyazypyr has shown good efficacy against the adult flies and we are developing an LD50 for the materials (Figure 7&8). 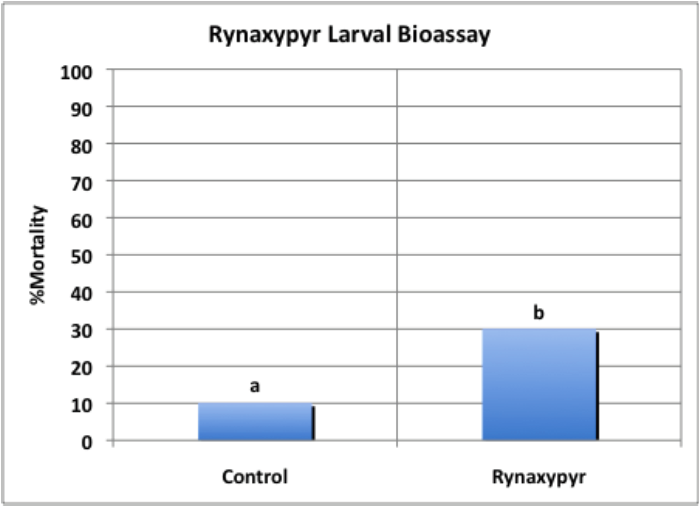 Larval tests using rynaxypyr have only shown a 20% reduction in survival when compared to the control (Figure 9) without the use of a penetrant. Use of a penetrant dramatically improved the results of rynaxypyr. 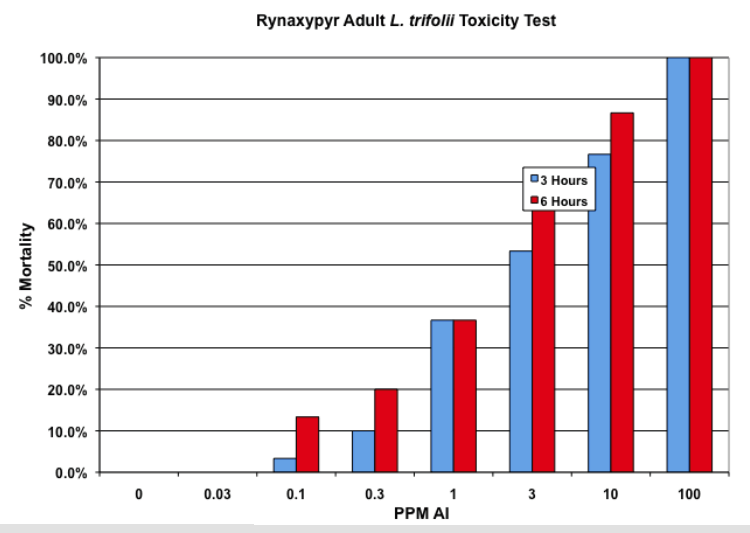 Methylated seed oil (MSO) used as a penetrant along with rynaxypyr provided 100% mortality of the L. trifolii larvae (Figure 10). 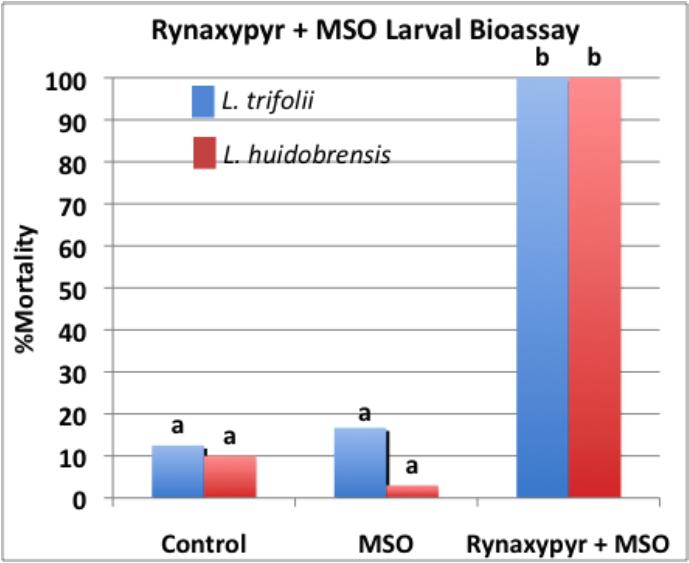 Similar results were seen with rynaxypyr + MSO against L. huidobrensis larvae (Figure 10). We have started major projects examining psyllid distribution within fields and psyllid distribution within plants. These will hopefully lead to improved sampling plans for this insect. In addition, we are investigating the potential for biological control of the psyllid and documenting the occurrence and timing of psyllid outbreaks across California. Funding from the Pepper Commission has been leveraged by acquiring additional financial support for our pepper research. 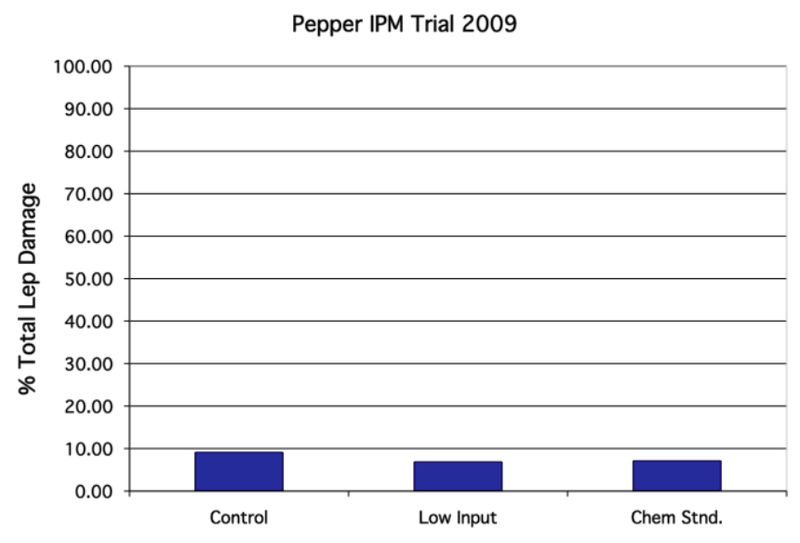 We have received monetary awards from the the USDA Pesticide Management Alternatives Program and the USDA Risk Assessment and Management Program to study and develop pepper IPM program strategies.